BOMB PROOF® 20 Degree Decline Olympic Bench Press - The BP-3 American Made Olympic Decline Bench Press by Bomb Proof features a 20 degree decline to isolate the lower and mid pectorals. The BP-3 decline weightlifting bench is classified as full commercial and is fabricated using heavy-duty 2 x 2 x 11 gauge steel tubing. The 11 wide x 44 long bench pad includes 2 thick high density foam to maximize user comfort on the heaviest lifts. When decline bench pressing, the most important feature of a decline weight bench is its ability to hold the user firmly in place so as to not slide down the bench during the lift. The BP-3 includes a pair of adjustable leg and foot rollers positioned to do just that; hold the user in place. The steel uprights that support the Olympic bar include 36 high bar catches and 28 high safety catches for assisting with missed reps. Need plate storage? There is an optional weight plate storage solution with four weight horns allowing all different sizes of Olympic plates to be stored in close proximity for quick change outs or drop sets. Your Bomb Proof workout bench is made to order and offers many different powder coat and vinyl colors to choose from at no extra cost. 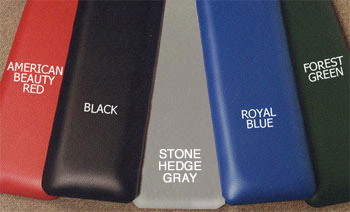 Need a custom color to match your existing equipment? Contact an Ironcompany strength equipment specialist for availability.